On Friday afternoon, the Stingers needed a late touchdown to beat the University of Toronto Varsity Blues in an exhibition game at Concordia Stadium. With the score 24-21 for the Blues, Toronto was forced to punt inside their own 10-yard line. 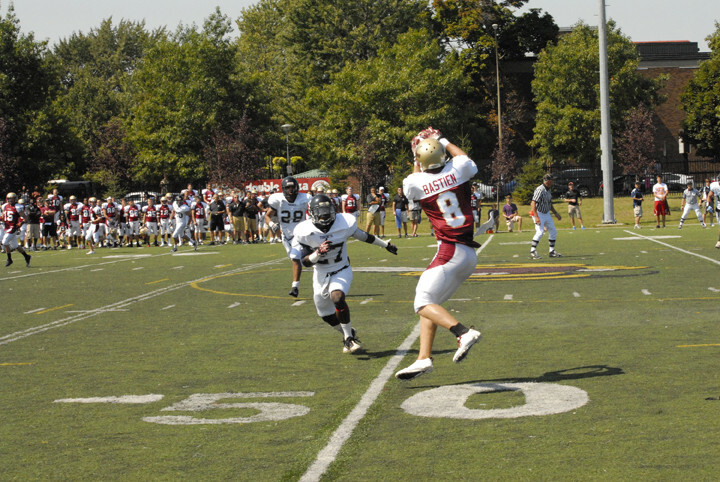 Instead of taking a safety, Toronto tried to punt the ball and the ball was subsequently blocked by Stingers linebacker Mikaël Charland and returned for the game-winning touchdown by Taylor Cook. Charland finished the game with five tackles and five defensive assists to go with the block. Nevertheless, Concordia was up 28-24 with 1:41 left in the game. They would add a field goal a minute later as insurance. Toronto had scored what looked to be the game winning touchdown with 2:47 to go in the fourth quarter on a beautiful throw by Toronto quarterback Chris Jugovic. Jurovic got off the pass just as he was about to get sacked, floating the ball between the uprights to the back middle of the endzone over all the Concordia coverage right into Paul de Pass’ hands. 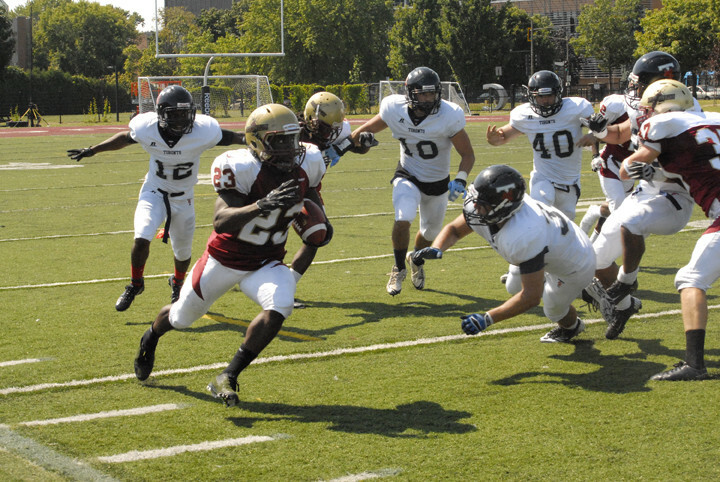 Concordia had built up a 14-0 halftime lead before Toronto stormed back in the third quarter to take a 17-14 lead. Michael Harrington’s long catch and run touchdown, his second of the day, on a fantastic seam route, gave the Stingers a 21-17 lead. The Stingers had a lot of trouble stopping Toronto’s bread and butter power running game. Two plays, the “power” and “counter trey,” gave the Concordia defense fits throughout the whole game. With three defensive starters out of play due to injury, expects to stop the interior run games of the other Quebec schools. If the defensive line has trouble with a Toronto team that only won three games last year, this may be a long year for the defensive guys in the trenches. If Concordia can stop the run and get pressure on the quarterback, which is easier said than done, then they will have a chance to go on to great things this year. Coach Mcgrath says their goal is to win a Vanier Cup. Lofty aspirations, but a healthy defensive line will go a long way to making sure Concordia achieves them. Offensively, there’s talent in the Stingers, who boast a lot of versatility within their receiving corps and in their running backs. Quarterback Reid Quest played the first half and completed 12 of 21 passes for 144 yards and two touchdowns, while Troy McCusker took over in the second half, completing five of eight passes for 123 yards and a score. But both must improve and ultimately stop playing nervous if they are have any success on offense. Too many times were balls thrown into double and even triple coverage; when the balls were on the money, the receivers showed great skill in running after the catch and picking up extra yards. Consistency is the key to playing quarterback and there is a lot to improve on from that standpoint. Next week, the Stingers officially start the regular season with a home game against the Bishop Gaiters on September 1st at Concordia Stadium, in what has to be called a “must-win game” against a beatable side from Lennoxville.